After a little more than two weeks on the DL with a lower back strain, Clayton Kershaw says he’s ready to get back on the mound. He’s not been afraid to throw hard to test out his body and arm in recent throwing sessions. However, despite Kershaw’s insistence that he’s ready, the Dodgers have no intention of rushing their ace back from injury. Kershaw threw long toss on flat ground on Tuesday, and he expects to do the same on Wednesday. That will put him on track to throw his first formal bullpen session this weekend. From there, it’s just a matter of time until the three-time Cy Young winner rejoins the Dodgers. Kershaw says he’s continued to throw the whole time he’s been on the DL. But he acknowledges that throwing off flat ground is different from sitting down and getting back up several times over the course of a game. The lefty still needs to build up some endurance with a few bullpen sessions and at least one minor league rehab start. 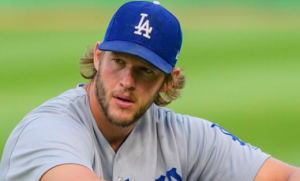 The fact that Kershaw returned from a herniated disc last season makes him confident that the rehab process will go smoothly this time around. He also confirmed to the media Tuesday that his current back problem is not nearly as bad as it was a year ago. Still, the Dodgers have no intention of rushing Kershaw back, in large part because they don’t have to. Los Angeles holds a 15-game lead atop the NL West. It would take a monumental collapse for the Dodgers not to win their fifth straight division title and reach the playoffs. The Dodgers also have a strong five-man rotation, even without Kershaw, following the acquisition of Yu Darvish at the trade deadline. The Dodgers don’t need Kershaw to secure a playoff spot. But they will need him to lead their rotation when the postseason begins. Roberts is hoping Kershaw will be able to make four or five major league starts before the playoffs to make sure he gets back on track. Such a timeline wouldn’t require Kershaw to return from the DL before the calendar flips to September. That means the Dodgers can exercise plenty of patience to make sure their ace is ready to take them where they haven’t been since 1988: the World Series.